Well, a new paper in PLoS One (PLoS ONE: Aquarium Nitrification Revisited: Thaumarchaeota Are the Dominant Ammonia Oxidizers in Freshwater Aquarium Biofilters.) got me thinking about a indoor locale that might get kids a little more excited than water heaters. 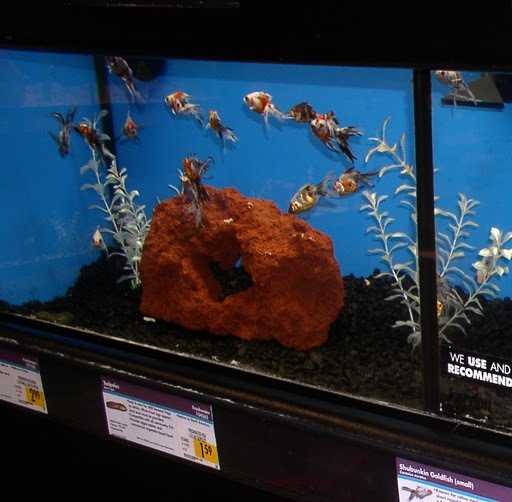 The paper focuses on microbes in filters from aquarium filters (fresh and salt water systems). The study used PCR and other molecular approaches to track and compare ammonia oxidation genes as well as bacterial and archaeal taxa. And they found an interesting correlation – there was a strong signal for higher levels of archaeal ammonia oxidizing taxa in freshwater but not salt water tanks. For the folks interested in ammonia and nitrogen pathways this is important and the authors suggest tanks like this could become a model system of sorts. But to me, this could become a great model system because one could imagine 100s-1000s of people sending in samples as part of a Citizen Microbiology project. Not that I am the first to think about this – many microbiology courses around the world have done projects on aquarium samples. But as far as I know they have not extended to “Citizen” project. I think I might pursue this … and I note … as part of our activities here we are going to be organizing a Citizen Microbiology workshop in the near future. So stay tuned. Jonathan, great blog post. Indeed, aquaria are ideal high-microbial-biomass built environments and well-suited for Citizen Microbiology initiatives. One of the reasons this project first excited me was precisely because it was organized from the beginning as a pilot Citizen Microbiology project. The aquarium samples and associated metadata were collected from Kitchener Waterloo Aquarium Society members after we contacted them and invited their participation. I’ve now given two talks at Society meetings now: one to explain the science behind our hypothesis and collect samples, the second was to present our preliminary results and thank them. The experience has been rewarding for KWAS members and a fantastic microbiology outreach opportunity. And importantly, the insightful questions KWAS members asked of the preliminary data presented at their meeting led to follow-up research that strengthened this publication. Josh – very interesting that this started as a Citizen micro project. I think there is no doubt we could pull off doing hundreds to thousands to even more samples. Maybe we can talk about this in the next couple of weeks. Hi Jonathan – sounds like a great project! This seems like something that would be a great fit to do in collaboration with BioCurious, our new community biolab in Sunnyvale. Especially if you want to go just a step further than merely collecting samples – maybe try to get some citizen scientists to grow some isolates, or amplify some 16S for sequencing. Let me know when you’re planning to do your Citizen Microbiology workshop. Heck, maybe we could set up a two-way video feed and run one at BioCurious at the same time.